With up to 744* users per SmartSwitch, the DBAS solution will save on fiber runs to the Central Office. 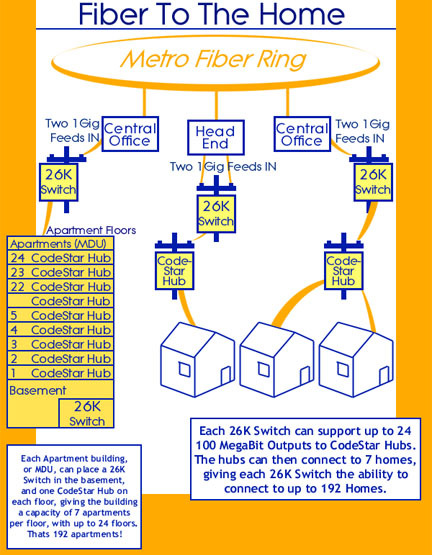 By building owners to provision multiple dwelling units (MDU) with fiber With up to 192* users per SmartSwitch, the DBAS solution can solve today's access delivery bottleneck and bring much talked about applications to the home. Our patented solution provides a low-cost passive fiber optic network using the popular star topology. DBAS offers the only passive optical Ethernet Network Interface Card in the market today. 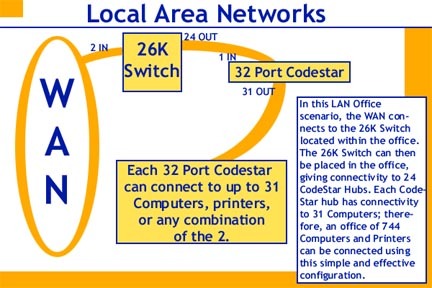 For the past 15 years, our CodeNet Architecture has been providing 10 Mbps passive optical local area networks. View Our Company Info, or send in a Request For Quote.